Despite the lack of snow, many people gathered to enjoy the spirit of winter at the Kickapoo Valley Reserve on Saturday, January 12, for its annual Winter Festival. The Kickapoo Valley Reserve spans over 8,000 acres. In 2000, the US Army Corps of Engineers officially transferred ownership of the land to the State of Wisconsin and the Bureau of Indian Affairs in Trust for the Ho-Chunk Nation to be jointly managed between the Ho-Chunk Nation and the Kickapoo Reserve Management Board. “The mission of the Winter Festival is just to get people outside in the winter – to have a family-friendly, community event,” Kickapoo Valley Reserve Executive Director, Marcy West said. The Ho-Chunk people have been involved with the Winter Festival since its inception in 2000. In past years, weather permitting, snowsnake and other traditional winter Ho-Chunk games were played. This year Ho-Chunk stories and education on Ho-Chunk pipes, gourds, drums, baskets, bowls, spoons, moccasins, corn, shirts, dresses, yarn belts, and hides were shared. Bill Greendeer recollects his first Winter Festival at the Kickapoo Valley Reserve. “My Dad Caaskaga (Orville Greendeer), was the storyteller. We built a ciiporoke and actually put on a pail with wintergreen tea. We had sumac and the old man put maple syrup in there and sweetened it up,” Greendeer said. “The telling of the stories have always been tied to the wintertime,” Greendeer said. 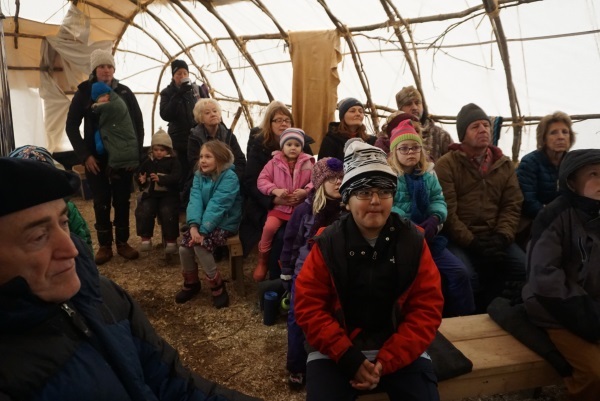 “With the weather changing as much as it has, there is not much snow here to allow us to do some of the Ho-Chunk games and to go snowshoeing and visit the ice caves, but we are still here and we are still doing this. That’s why I’m happy to be here,” Greendeer said. People who attended the Winter Festival could participate in a variety of activities including a 5k run/walk, interactive snow sculpting, giant Jenga, arctic checkers, frozen turkey bowling, archery, a chili and bread contest sampling, penguin races, and children’s stories and crafts. Face painting for kids was offered by the La Farge High School art students. A Kickapoo Quick Auction was held in the afternoon with items donated by various individuals and local businesses. The proceeds will benefit the Kickapoo Valley Reserve Education and Events Program. The day’s activities were concluded with a guided ice hike.